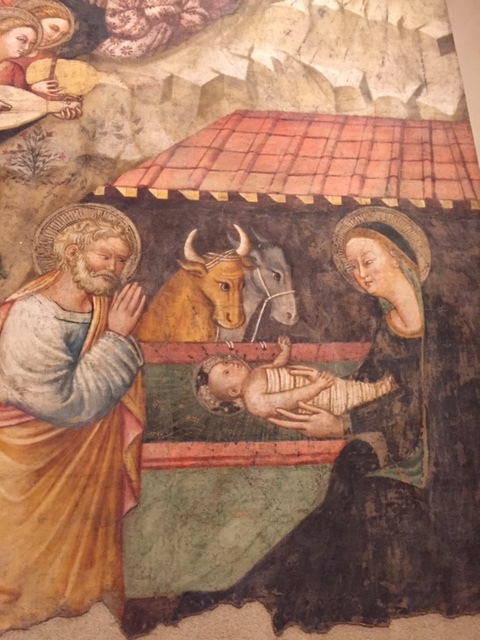 My all-time favorite image for Christmas was painted into a fresco by an unknown artist around 1370 in the Umbria area of Italy. It depicts a shepherd playing a sort of bagpipe. His smiling dog dances in delight. This is part of fresco fragments from the long-gone monastery of Santa Giuliana in Perugia. The fragments, covering about 20 feet in width and maybe 12 feet in height, are now in the Galleria Nazionale of Umbria. I’d travel back there just to gaze at them again. 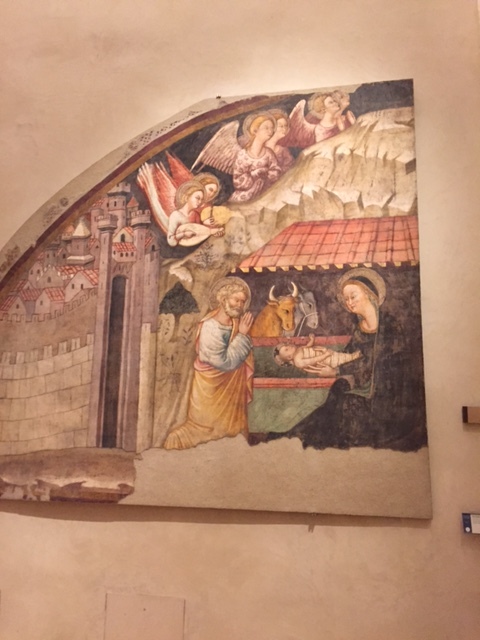 I wrote about this fresco last Christmas, and took another look this year. My favorite shepherd and his dog are really just side figures in a more conventional Nativity fresco. The entire fresco is too large to photograph in one shot, and my photography skills are pretty much limited to what I can capture on my trusty iPhone. So the view above shows the shepherd and his bagpipe, but not his joyful dog. 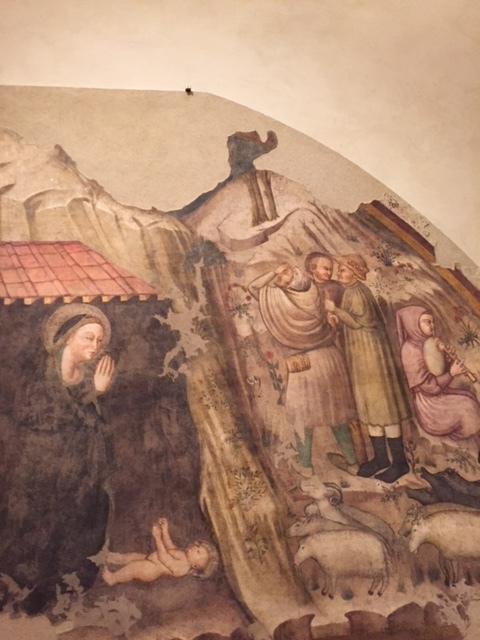 The other side of the fresco, which once covered a wall, shows the traditional Nativity scene with the stable, the town of Bethlehem, musical angels neatly arranged in pairs, some friendly cattle, and Mary and Joseph with their child duly wrapped in strips of cloth–the Biblical swaddling clothes. The details are charming, the faces friendly and serene. What I find most appealing is the artist’s careful concern for the ordinary people depicted. They are painted somehow larger than life, and in loving detail. A friend of mine commented on the cozy-looking black socks worn by one of the shepherds on his way to the stable. At least I think they are shepherds–or could they be the Three Kings? Whoever they are, their feet are REALLY big. 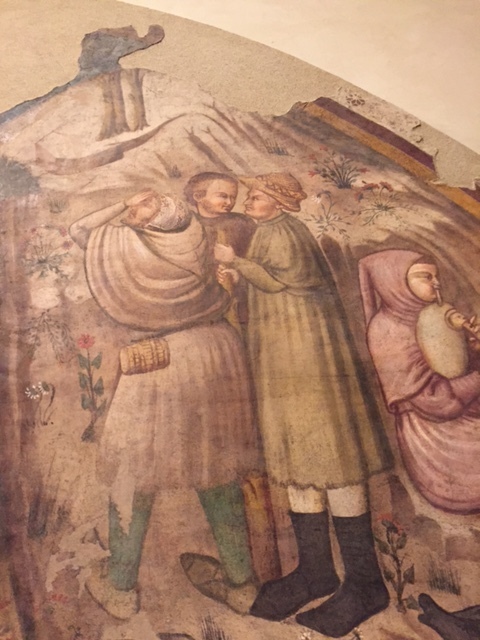 This fresco was placed high on a wall, under a vaulted ceiling. The rules of perspective would have dictated that the feet should be smaller in proportion to the heads. The artist chose to do the opposite. Maybe the artist didn’t exactly have perspective down pat. Then again, maybe he (or she) just wanted to contrast grounded humanity with floating angels. These folks definitely have their feet on solid ground. The animals are grounded, too. These are real sheep, solid and woolly. And each one has a unique personality, as animals do. As a child, I always wondered what became of the sheep left behind on that hillside, after the angels in the story told the shepherds to get themselves into Bethlehem posthaste. 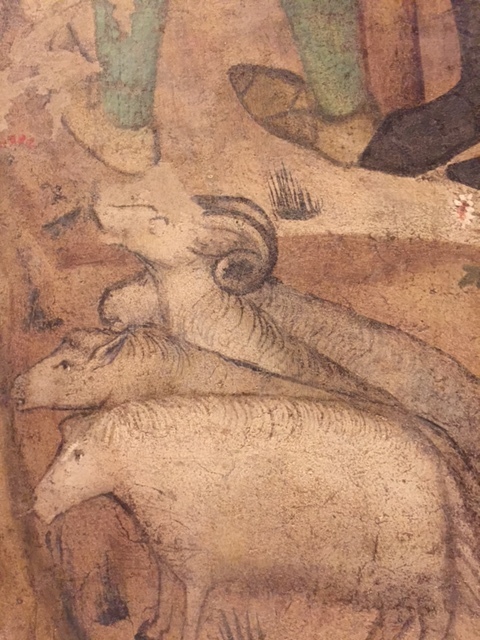 Maybe the unknown artist of this fresco had an anwer: the sheep trotted right along. The horned sheep seems to get what’s going on; he raises his head as though somehow lifted up by what he’s seeing. On this Christmas Eve, my wish is for all of us to remember that we share this beautiful earth with many others. To those who celebrate Christmas and to those who don’t, I wish peace, friendship and health. 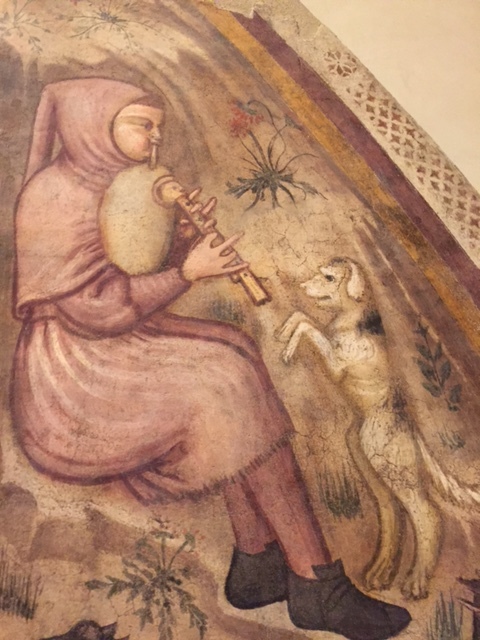 This entry was posted in Art, Italy, Why I Love Italy and tagged Galleria Nazionale dell'Umbria, medieval bagpipe, Medieval dancing dog, medieval Nativity fresco, Perugia on December 25, 2016 by Claudia Suzan Carley.